Photo study for a personal piece. Really enjoyed this and stopped when I felt it served its purpose. 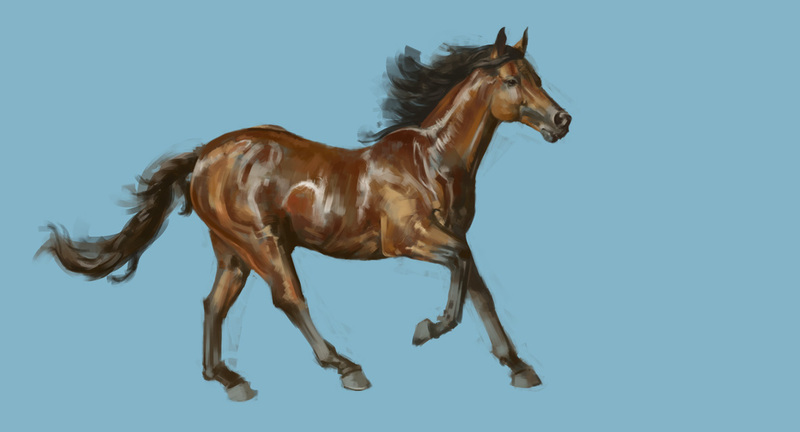 Realised with one painting I really didn't know how to paint a horse, so with proportions/musculature as the main focus (those damnable legs!) I went on to have a lot of fun with it as a colour study as well. Trying out the digital sketchbook at life drawing. Great fun! I post these acknowledging that the quality isn't soaring, but I was most interested in the pattern/rate of improvement. All between 20\30 mins, I spent a (steadily decreasing) portion of each pose wrapping my head around a new tool. That feeling you have when your brain is trying to compute technical/physical material complications, as opposed to just drawing or trusting your hand? Yeah, that. Just keep pushing. P.S. Getting to grips with PaintTool SAI on a 700t Ativ Smart PC Pro. Graduate of Animation Production from The Arts University College Bournemouth [AUCB]. © Francis Kelleher 2012. Powered by Blogger.